Being a plow-to-package grain farm means we do everything ourselves, working with nature each step of the way. At Bluebird Grain Farms our goal is to cultivate and mill the most irresistible, nutrient-rich grain we can, while leaving this land healthier for the next generation. For our family and staff, great taste, real nutrition and a thriving countryside go hand in hand—you simply don’t get one without the others. Living soil best propagates life. By keeping our fields nutritionally balanced and teeming with beneficial microbes, we reap highly nutritious grains. That means feeding, resting and otherwise caring for each and every inch of earth naturally, without compromise. Our grains are grown in rich soils sweetened with additional organic amendments right here in the northwestern United States. 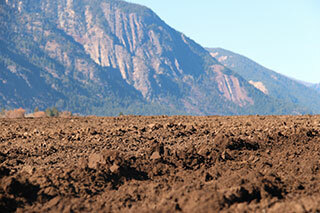 We use cover crops to build organic matter and protect our soils from erosion. 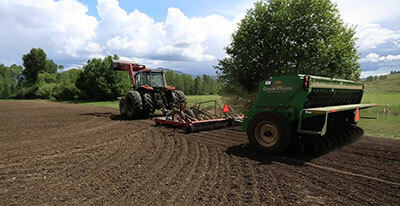 Our tillage and planting are timed for optimum seed germination and natural weed control. And after harvest, we incorporate our grain-straw back into the soil that it came from. 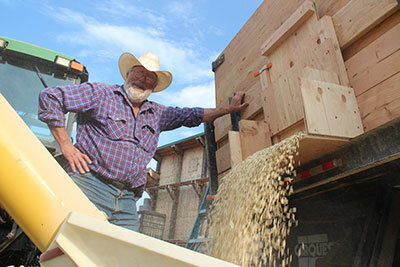 We condition our grains in custom-built, old-world wooden granaries, like our ancestors did before us. Any moisture in our grain is absorbed by their wood; that’s why mold and rot—and using chemicals to control them—are never an issue at Bluebird. Our grains are cleaned and milled to order each week in small batches so you get the freshest product available. It’s a difference you’ll taste in every bite of the pastas, breads, sweets and other foods you make with Bluebird Grain Farm products.